Originally published in Journal of Creation 18, no 2 (August 2004): 28-36. Abiogenesis is the theory that under the proper conditions life can arise spontaneously from non-living molecules. One of the most widely cited studies used to support this conclusion is the famous Miller-Urey experiment. Surveys of textbooks find that the Miller-Urey study is the major (or only) research cited to prove abiogenesis. 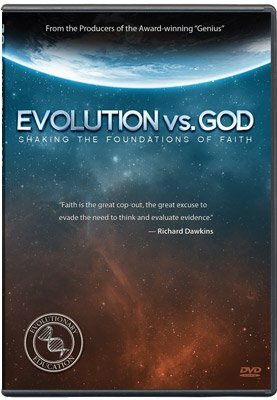 Although widely heralded for decades by the popular press as ‘proving’ that life originated on the early earth entirely under natural conditions, we now realize the experiment actually provided compelling evidence for the opposite conclusion. It is now recognized that this set of experiments has done more to show that abiogenesis on Earth is not possible than to indicate how it could be possible. This paper reviews some of the many problems with this research, which attempted to demonstrate a feasible method of abiogenesis on the early earth. Darwin recognized how critical the abiogenesis problem was for his theory. He even conceded that all existing terrestrial life must have descended from some primitive life-form that was originally called into life ‘by the Creator’.9 But to admit, as Darwin did, the possibility of one or a few creations is to open the door to the possibility of many others! If God made one type of life, He also could have made many thousands of different types. Darwin evidently regretted this concession later and also speculated that life could have originated in some ‘warm little pond’ on the ancient earth. Genes require enzymes in order to function, but genes are necessary to produce enzymes. In time, trace amounts of several of the simplest biologically useful amino acids were formed—mostly glycine and alanine.30 The yield of glycine was a mere 1.05%, of alanine only 0.75% and the next most common amino acid produced amounted to only 0.026% of the total—so small as to be largely insignificant. In Miller’s words, ‘The total yield was small for the energy expended.’31 The side group for glycine is a lone hydrogen and for alanine, a simple methyl (-CH3) group. After hundreds of replications and modifications using techniques similar to those employed in the original Miller-Urey experiments, scientists were able to produce only small amounts of less than half of the 20 amino acids required for life. The rest require much more complex synthesis conditions. It was believed that the results were significant because some of the organic compounds produced were the building blocks of much more complex life units called proteins—the basic structure of all life.34 Although widely heralded by the press as ‘proving’ that life could have originated on the early earth under natural conditions (i.e. without intelligence), we now realize the experiment actually provided compelling evidence for exactly the opposite conclusion. For example, without all 20 amino acids as a set, most known protein types cannot be produced, and this critical step in abiogenesis could never have occurred. Was there a methane-ammonia atmosphere? Yet another reason to conclude free oxygen existed on the early earth is that it is widely believed that photosynthetic organisms existed very soon after the earth had formed, something that is difficult for chemical evolutionary theories to explain. A 2004 paper argues from uranium geochemistry that there were oxidizing conditions, thus photosynthesis, at 3.7 Ga.42 But according to uniformitarian dating, the earth was being bombarded by meteorites up to 3.8 Ga. So even granting evolutionary presuppositions, this latest research shows that life existed almost as soon as the earth was able to support it, not ‘billions and billions of years’ later. Even if the oxygen were produced by photodissociation of water vapour rather than photosynthesis, this would still be devastating for Miller-type proposals. Urey also speculated that the oceans in the ancient earth must have consisted of about a 10% solution of organic compounds that would be very favourable for life’s origin.43 This level of organic matter would equal a concentration about 100 times higher than a modern American city’s sewer water. The total amount of extant organic compounds on the earth today could not produce even a fraction of that needed to achieve a concentration this high in the oceans. ‘Soon after the Miller-Urey experiment, many scientists entertained the belief that the main obstacles in the problem of the origin of life would be overcome within the foreseeable future. But as the search in this young scientific field went on and diversified, it became more and more evident that the problem of the origin of life is far from trivial. Various fundamental problems facing workers in this search gradually emerged, and new questions came into focus … . Despite intensive research, most of these problems have remained unsolved. Some of these major problems will now be reviewed. To produce even non-functional amino acids and proteins, researchers must highly control the experiment in various ways because the very conditions hypothesized to create amino acids also rapidly destroy proteins. Examples include thermal denaturing of proteins by breaking apart their hydrogen bonds and disrupting the hydrophobic attraction between non-polar side groups.47 Very few proteins remain biologically active above 50ºC, or below about 30ºC, and most require very narrow conditions. Cooking food is a good example of using heat to denature protein, and refrigeration of using cold to slow down biological activity. As any molecular biologist knows from daily lab work, the pH also must be strictly regulated. Too much acid or base adversely affects the hydrogen bonding between polar R groups and also disrupts the ionic bonds formed by the salt bridges in protein. Miller had to deal with the fact that the common cross-reactions of biochemical reaction products cause destruction or interfere with amino acid production. All compounds that interfere with bonding must be isolated or they will destroy the proteins. Therefore, Miller had to remove many contaminants and impurities to obtain pure compounds that are not normally found in life. Otherwise, his apparatus would have produced many destructive cross-reactions. This is no small problem. Many organic compounds, such as ethanol and isopropyl alcohol, function as disinfectants by forming their own hydrogen bonds with a protein and, as a result, disrupt the proteins’ hydrophobic interactions.48 Alcohol swabs are used to clean wounds or to prepare skin for injections because the alcohol passes through cell walls and coagulates the proteins inside bacteria and other cells. Also, heavy metal ions such as Ag+, Pb2+ and Hg2+ must be isolated from proteins because they disrupt the protein’s disulfide bonds, causing the protein to denature. As an example, a dilute (1%) AgNO3 solution is placed in the eyes of newborn babies to destroy the bacteria that cause gonorrhea. Many heavy metal ions are very toxic if ingested because they severely disrupt protein structure, especially enzymes. Many speculate that ultraviolet light was the source used to create life, but UV is highly toxic to life, and is, in fact, often used to destroy life (thus UV lights are used in hospitals to kill micro-organisms). The intensity of the destructive long wavelengths exceeds that of the constructive short ones, and the quantum efficiency of destruction is much higher than that for construction as well.54 This means that destruction of amino acids is four to five orders of magnitude higher than construction. In Miller’s UV experiments, he used a select wavelength to produce amino acids and screened out other wavelengths because they destroy amino acids. Yet both chemical-building and chemical-destroying light exists in sunlight. Amino acids are actually very delicate and readily break down under natural sunlight. The Miller-Urey experiment also had strategically designed traps to remove the products from the radiation before they could be destroyed. On a primitive earth, any amino acids formed in the atmosphere would be destroyed long before they could be removed. Even the ocean would not protect them, because UV penetrates several metres of liquid water—you can even sunburn under water. This indicates that the conditions on the early earth could never have been favourable for abiogenesis. Even simple movement can cause major protein damage: whipping cream or beating egg whites is one way of using mechanical agitation to deliberately denature protein (the whipping stretches the polypeptide chains until the bonds break). 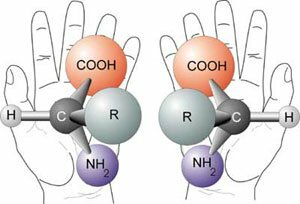 The amino acid assembly problem is complicated by the fact that amino acids are able to bond in many locations by many kinds of chemical bonds. To form polypeptide chains requires restricting the links to only peptide bonds, and only in the correct locations. All other bonds must be prevented from being formed, no easy task. In living cells, a complex control system involving enzymes exists to ensure that inappropriate bonds do not normally occur; without this system, these inappropriate bonds would destroy the proteins produced. 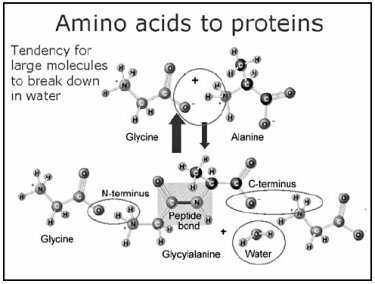 To form a protein, amino acids must link together to form a peptide bond, eliminating a water molecule. But there is a far greater tendency for the reverse to happen. This would be even more of a problem in water. Another problem is that the strong thermodynamic tendency is for the peptide bonds to break down in water, not to form.66 Without high-energy compounds such as ATP and enzymes, amino acids do not form the many polypeptides needed for life. Even dipeptides are difficult to form under natural conditions, yet the average protein is composed of around 400 amino acids. Another theory is that abiogenesis may have been a consequence of the ‘self-ordering properties’ of biochemicals.68 Just as electrostatic forces produce highly ordered crystals of salt from Na+ and Cl- ions, so too, some Darwinists reasoned, in the same way, life may likewise self-assemble. This approach also has failed. For example, all nucleotide base pairs have an equal affinity to the sugar phosphate backbones on each side of the DNA molecule, and consequently, their order is not a result of bonding affinity differences but is due to information-directed assembly. In other words, the information does not derive from the DNA chemistry, but is instead external to it (see next section). ‘What makes the origin of life and of the genetic code a disturbing riddle is this: the genetic code is without any biological function unless it is translated; that is, unless it leads to the synthesis of the proteins whose structure is laid down by the code. But … the machinery by which the cell (at least the non-primitive cell, which is the only one we know) translates the code consists of at least fifty macromolecular components which are themselves coded in the DNA. Thus the code can not be translated except by using certain products of its translation. This constitutes a baffling circle; a really vicious circle, it seems, for any attempt to form a model or theory of the genesis of the genetic code. A major unresolved question that ‘involves psychology and history more than chemistry’ is, ‘Why has the Miller-Urey experiment had such a strong impact on the origin-of-life field?’80 Shapiro concludes a major reason is that the experiment seems to imply that we are on the verge of understanding how life was created without intelligence or design. In the public mind (and in the minds of many scientists) this experiment psychologically supports abiogenesis. But the Miller-Urey results, and the many similar experiments completed since then, actually show the opposite of what the Miller-Urey experiment purported to demonstrate. Few textbooks actually analyze the results, and most uncritically accept this experiment as proof of how the building blocks of life were produced and then imply that the only task left was to determine how they were assembled. We must conclude, as Ridley did, that the early forms of life, and how natural selection could shape them, are ‘so obscure at the primordial stage that we can only guess why complexity might have increased’. When confronted with this evidence, supporters of abiogenesis argue that science must be naturalistic, and we have no choice but to tell the best story we have, even if it is not a complete or even accurate story.93 Although widely heralded by the popular press for decades as ‘proof’ that life originated on the early earth entirely by natural conditions, the Miller-Urey experiments have actually provided compelling evidence for exactly the opposite conclusion. This set of experiments—more than almost any other carried out by modern science—has done much more to show that abiogenesis is not possible on Earth than to indicate how it could be possible. I want to thank Tim Wallace, Bert Thompson, Wayne Frair, Clifford Lillo and John Woodmorappe for their comments on an earlier draft of this article. Davies, P., The Fifth Miracle: The Search for the Origin and Meaning of Life, Simon & Schuster, New York, pp. 17–18, 1999. Dickerson, R.E., Chemical evolution and the origin of life, Scientific American 239(3):62–102, 1978. Johnson, P., Reason in the Balance; The Case Against Naturalism in Science, Law and Education, InterVarsity Press, Downers Grove, 1995. Dover, G., Looping the evolutionary loop; review of: The Origins Of Life: From The Birth Of Life To The Origin Of Language, Nature 399:217–218, 1999.
de Duve, C., Vital Dust: Life as a Cosmic Imperative, Basic Books, New York, 1995. Denton, M., Nature’s Destiny; How the Laws of Biology Reveal Purpose in the Universe, The Free Press, New York, 1998. Darwin, C., Origin of Species, reprint of 6th edition, P.F. Collier, New York, p. 316, 1900. This concession to theism was absent in earlier editions. Oparin, A., The Origin of Life, New York, Dover, 1965. Poundstone, W., Carl Sagan; A Life in the Cosmos, Henry Holt, New York, 1999. Dyson, F., Origins of Life, Cambridge University Press, p. 31, 1990. Bernal, J.D., The physical basis of life, Physical Society of London Proceedings, Section A 62:537, 1947. Haldane, J.B.S., Rationalist Annual, 1928; reprinted in: Science and Human Life, Harper and Brothers, New York, 1933. 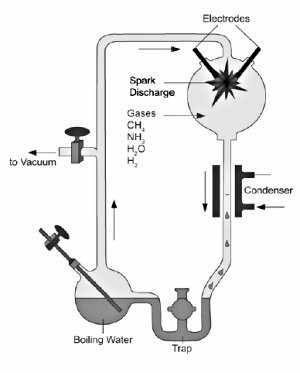 Calvin, M., Reduction of carbon dioxide in aqueous solutions by ionizing radiation, Science 114:416–418, 1951. Urey, H., The Planets: Their Origin and Development, Yale University Press, New Haven, pp. 149–157, 1952. Lewis, R., Life, 3rd edition, WCB McGraw-Hill, Boston, p. 153, 1999. Colson, C. and Pearcey, N., How Now Shall We Live? Tyndale House, Wheaton, p. 69, 1999. Shapiro, R., Origins; A Skeptics Guide to the Creation of Life on earth, Summit Books, New York, p. 99, 1986. Lahav, N., Biogenesis: Theories of Life’s Origin, Oxford University, New York, 1999. Wells, J., Icons of Evolution, Regnery, Washington, 2000. Campbell, N.A., Mitchell, L.G. and Reece, J.B., Biology Concepts and Connections, 3rd edition, Addison Wesley Longman, Inc., San Francisco, 2000. Miller, S.L., A production of amino acids under possible primitive earth conditions, Science 117:528–529; p. 528, 1953. Shapiro, ref. 20, p. 100. Miller, S.L., Production of some organic compounds under possible primitive earth conditions, J. American Chemical Society 77:2351–2361, 1955. Miller, ref. 24, p. 529. Fox, S. and Dose, K., Molecular Evolution and the Origin of Life, Marcel Dekker, New York, p. 44, 1977. Sleep, N.H., Biogeochemistry; oxygenating the atmosphere, Nature 410:317–319; 2001, p. 319. Horgan, J., The End of Science: Facing the Limits of Knowledge in the Twilight of the Scientific Age, Addison-Wesley, Reading, p. 130, 1996. Jamali, F., Lovlin, R., Corrigan, B.W., Davies, N.M. and Aberg, G., Stereospecific pharmacokinetics and toxicodynamics of ketorolac after oral administration of the racemate and optically pure enantiomers to the rat, Chirality 11(3):201–205, 1999. Coppedge, J.F., Probability of left-handed molecules, CRSQ 8:163–174, 1971. Simpson, S., Life’s first scalding steps, Science News 155(2):24–26, 1999; p. 26. Flowers, C., A Science Odyssey: 100 Years of Discovery, William Morrow and Company, New York, p. 173, 1998. Scherer, S., Could life have arisen in the primitive atmosphere? J. Molecular Evolution 22(1):91–94, 1985; p. 92. Thaxton, C., Bradley, W. and Olsen, R., The Mystery of Life’s Origin; Reassessing Current Theories, ch. 5, Philosophical Library, New York, 1984. Rosing, M.T. and Frei, R., U-rich Archaean sea-floor sediments from Greenland—indications of >3700 Ma oxygenic photosynthesis, Earth and Planetary Science Letters 217: 237–244, 2004. Urey, ref. 17, p. 153. Campbell, N.A., Biology, Benjamin/Cummings, Redwood City, 1993. Campbell et al., ref. 23, p. 321. Lahav, ref. 21, p. 50. Timberlake, K., Chemistry: An Introduction to General, Organic, and Biological Chemistry, Benjamin Cummins, San Francisco, 2001. Witham, L., By Design: Science and the Search for God, Encounter Books, San Francisco, p. 106, 2003. Witham, ref. 43, p. 98. Vogel, G., RNA study suggests cool cradle of life, Science 283(5399):155–156, 1999. Williams, E.L., The evolution of complex organic compounds from simpler chemical compounds: is it thermodynamically and kinetically possible? CRSQ 4:30–35, 1967. Hulett, H.R., Limitations on Prebiological Synthesis, Journal of Theoretical Biology 24:56–72, 1969. Horgan ref. 30, p. 138. Yockey, H.P., Information Theory and Molecular Biology, Cambridge University Press, Cambridge, p. 336, 1992. Colson and Pearcey, ref. 19, p. 71. Haeckel, E., The Last Link: Our Present Knowledge of the Descent of Man, Adam and Charles Black, London, p. 120, 1898. Haeckel, ref. 51, p. 48. Meyer, S., DNA and other designs, First Things, April, pp. 30–38, 2000; p. 31. Conklin, E.G., Embryology and evolution; in: Mason, F. (Ed. ), Creation by Evolution, Macmillan, New York, pp. 63–64, 1928. Denton, M., Evolution: A Theory in Crisis, Adler and Adler, Bethesda, p. 250, 1986. Cairns-Smith, A.G., The first organisms, Scientific American 252(6):90–100, 1985. Sarfati, J., Origin of life: the polymerization problem, TJ 12(3):281–284, 1998. Kauffman, S., The Origins of Order, Oxford University Press, New York, 1993; At Home in the Universe, Oxford University Press, New York, 1995. Horgan, ref. 30, p. 139. Pigliucci, M., Where do we come from? A humbling look at the biology of life’s origin, Skeptical Inquirer 23(5):21–27, 1999. Dembski, W.A., The Design Inference: Eliminating Chance Through Small Probabilities, Cambridge University Press, Cambridge, England, 1998. Polanyi, M., Life’s irreducible structure, Science 160:1308, 1968. Davies, P., Life force, New Scientist 163(2204):27–30, 1999; p. 28. Popper, K.R., Scientific reduction and the essential incompleteness of all science; in: Ayala, F. and Dobzhansky, T. (Eds. ), Studies in the Philosophy of Biology, University of California Press, Berkeley, p. 270, 1974. Sarfati, J., Self-replicating Enzymes? A critique of some current evolutionary origin-of-life models, TJ 11(1):4–6, 1997. Sarfati, J., Origin of life: the chirality problem, TJ 12(3)263–266, 1998. Sarfati, J., Origin of life and the homochirality problem: is magnetochiral dichroism the solution? TJ 14(3)9–12, 2000. Shapiro, ref. 20, p. 107. Davies, ref. 1, p. 17. Levy, M. and Miller, S.L, The stability of the RNA bases: Implications for the origin of life, Proc. Nat. Acad. Sci. USA 95:7933–7938, 1998. Behe, M., Darwin’s Black Box, Basic Books, New York, 1996. Johnson, P., Weekly Wedge Update, April 30, p. 1, 2001. Serafini, A., The Epic History of Biology, Plenum, New York, p. 292, 1993. Ridley, M., The Cooperative Gene; How Mendel’s Demon Explains the Evolution of Complex Beings, The Free Press, New York, p. 84, 2001.